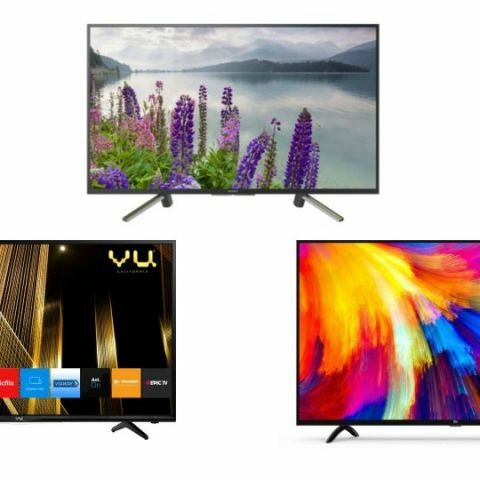 Today, the Flipkart is offering the Vu Smart 4K TVs with a hefty price cut. The other gadgets we have found on Flipkart are from brands like Sony, TCL, and Thomson. If you’re on the lookout for a smart TV for your home then this might be the right time to get it. We have covered the best TV deals that are currently going on Flipkart on brands like TCL, Sony, Vu and more. The Vu Official Android UHD 4K TV offers a resolution of 3840 x 2160 pixels with a panel size of 49-inches. The device allows you to download apps like Netflix, Youtube, Ted and more from the Google play store. It also features a built-in soundbar with Dolby audio for an enhanced experience. Click here to buy. The Sony 49-inch Full HD LED Smart TV offers a resolution of 1080 x 1920 pixels. The device comes with voice control feature that allows you to search for the specific movie or a show with a voice command. This Android TV also lets you download apps like Netflix, Youtube, Ted and more. Click here to buy. The TCL Ultra HD 4K LED Smart TV offers a resolution of 3840 x 2160 pixels with a panel size of 43-inches. The device lets you download the apps from the Google Play store on your TV. It is also equipped with a voice search that lets you find the apps and content of your choice via voice command. With the Chromecast feature, users can also watch the content of their smartphone on a bigger screen. Click here to buy. The Vu Official Android Ultra HD 4K LED Smart TV offers a resolution of 3840 x 2160 pixels with a panel size of 55-inches. With the Official Android 8.0, the users can download the apps and content from the Google Play store on the TV. It also has a built-in subwoofer which comes with Dolby audio. Click here to buy. The Thomson LED Smart TV offers a resolution of 3840 x 2160 pixels with a panel size of 43-inches. This Smart TV lets you download apps like Netflix, Youtube, Sony Liv and more. The device has three HDMI ports and two USB ports to connect external devices like USB flash drive, FireTV and more. Click here to buy.